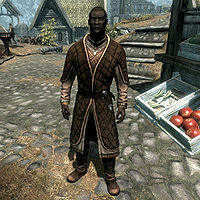 Nazeem is a Redguard citizen and the owner of Chillfurrow Farm, just south of Whiterun. He is known to be arrogant, self-righteous and patronizing towards everybody, much to the regret of his wife Ahlam and the citizens of Whiterun. Despite owning Chillfurrow Farm, Nazeem never sets foot outside Whiterun and instead sleeps with his wife at The Drunken Huntsman every night between 8pm and 8am. After waking up he immediately heads to the local market, where he spends four hours inspecting the stalls and insulting the merchants. Starting at noon, he wanders lazily around town until it is time for even more relaxation at the Huntsman between 4pm and his bedtime. On Loredas and Sundas, he was supposed to visit the farm at 12pm, but doesn't due to a bug. His wealth is undeniable and he sports a set of upper-class attire, including fine clothes and matching boots. He carries the key to the farmhouse, along with a key to Wintersand Manor. He also carries a steel dagger and his pockets are filled with upper-class items and gold. He speaks in a very condescending manner with remarks such as "Do you get to the Cloud District very often? Oh, what am I saying - of course you don't." He also claims to be an advisor to the Jarl, patronizingly saying: "I actually advise the Jarl on political matters. My input is invaluable, of course. But this is all probably a bit over your head." He will also tell how he earned his status: "Oh, it took years, but I earned my way to the top. I own Chillfurrow Farm, you see. Very successful business. Obviously." His wife Ahlam is quite embarrassed with his behavior and feels he does not respect her properly, saying, "If you run into my husband Nazeem, remind him that he's not married to himself." and making fun of his imaginary relations with the Jarl: "Looking for my husband Nazeem? Check the Jarl's backside. That's usually where he stuffs himself these days." During her work hours in the Temple of Kynareth she will often complain about her idiotic husband, as seen in this section. It is interesting to note that Nazeem is never seen setting foot in or around Dragonsreach, despite constantly reminding the player how important he is to the Jarl. Nazeem carries the Key to Wintersand Manor, even though Wintersand Manor is a removed or unimplemented location. He was supposed to visit his farm every Loredas and Sundas at 12pm, but his WhiterunPatrol package is set to 'any' meaning it will always take precedence. Sometimes when Nazeem dies and his body is removed from the area by the game, his burial urn will not be found in the Hall of the Dead. ? This page was last modified on 30 August 2018, at 21:21.